Staffing tends to be a common problem for many employers. 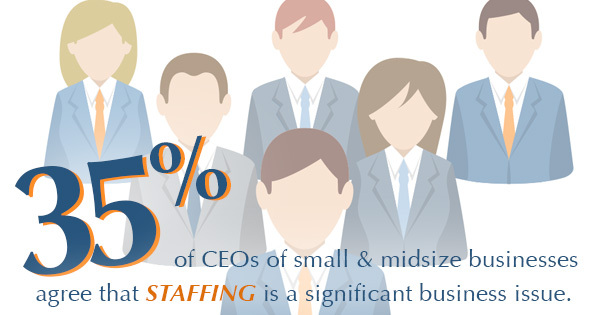 Over half (57%) of organizations have issues with retention and a full 35% of CEOs of small and midsize businesses agree that staffing is a significant business issue. A troublesome component of staffing is the occasional need to lay employees off. When a company needs to restructure its staff, they may have to make necessary cuts to their workforce. It can be difficult for a management team to let go of established staff members for the sake of the company as a whole. Although the process can lead to emotional turmoil for both the employees and the managers, the utilization of an outplacement package can ease the burden on both parties. What is an outplacement service? You see, outplacement services offer assistance to laid-off employees to help them transition into a new career. Many restructuring consulting firms suggest including some sort of outplacement accommodations to reduce staff in an empathetic way. It'll help terminated employee find new job opportunities, and provide them with the opportunity to take a variety of skill-building programs, such as career counseling and resume writing courses. This way, the laid-off employee is not without resources to get back on their feet after losing their job. Beyond helping the employees, there are several other benefits to offering outplacement services. As a company, your commitment to your employees speaks volumes about your brand and your values. Even in times of change and restructuring, you remain dedicated to your employees. This can have a direct impact on attracting future talents: they can see that the management truly cares about their employees. No matter what, employees like to feel recognized and cared for. In fact, 86% of companies with some type of employee recognition programs boast an increase in worker happiness. Outplacement offers the same type of recognition by proving that employers care about their workers, even if they have to downsize the staff. Since each employee is different, an outplacement service should not be one size fits all. The exact resources a person will need to transition to another career will vary by individual. As a business owner, you want to do the right thing and provide these resources. Consider hiring a professional outplacement consulting firm to assist in cultivating a program for your business. An outplacement consulting service can and will help you develop specialized solutions to meet your unique needs and the needs of your employees. It can be difficult to lay-off employees, but outplacement services make the transition easier for both employees and management. Contact an outplacement consulting firm to start offering this invaluable service to your staff today.